Tokyo – Inflammatory bowel disease (IBD), including the two conditions ulcerative colitis and Crohn's disease, results in long-term inflammation of the gut and is associated with dysregulation of the immune system. However, it is notoriously difficult to determine the cause of IBD, although genetic and environmental factors are implicated. To better understand disease development, researchers have developed a mouse model in which gut inflammation is induced by addition of the chemical dextran sodium sulfate (DSS) to the drinking water of mice. Mice lacking the MKL1 protein, which shuttles between cytoplasm and nucleus serving as a transcriptional co-factor of serum response factor, develop less-severe inflammation in the IBD model than control animals. This suggested that MKL1 has a role in IBD disease development, but the details of this were unclear. Researchers at Tokyo Medical and Dental University (TMDU) built on this knowledge by generating mice overexpressing human MKL1 in specific white blood cells. They revealed that MKL1 causes the development of inflammation by controlling white blood cell functions. Their findings were published in Scientific Reports. The gut lining closest to the intestinal canal contains a layer of tissue including white blood cells known as macrophages, which are the scavengers of the immune system. These macrophages help maintain the gut equilibrium, and protect it from infection. The TMDU researchers showed MKL1 is expressed at higher levels in the macrophages of mice treated with DSS than untreated mice. This strongly suggested a role for macrophage MKL1 in the development of IBD. The team then developed mice that expressed high levels of human MKL1 specifically in their lineage of macrophages, which are large white blood cells regulating the immune system. "We noticed that these transgenic mice had fewer proportion of macrophages and more monocytes in the lining of their colon wall than control mice," explains Jianbo An, lead author of the study. "Intestinal macrophages suppress inflammation as a part of their defensive immune response." "Microscopic examination of the colons of DSS-treated transgenic mice revealed destruction of the epithelium and severe ulceration," corresponding author Akinori Kimura says. "This was accompanied by a massive influx of inflammatory cells. The fulminant pathology may result from mitigated anti-inflammatory property of macrophages." As the overexpression of MKL1 worsens the development of IBD-associated inflammation, this suggests that targeting of the protein or gene has potential for the treatment of IBD, which currently has no cure. 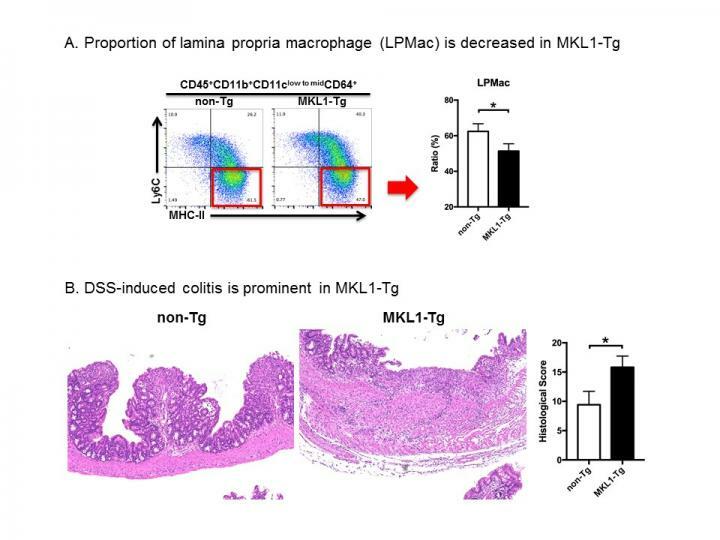 The article, "MKL1 expressed in macrophages contributes to the development of murine colitis" was published in Scientific Reports at DOI:10.1038/s41598-017-13629-0.